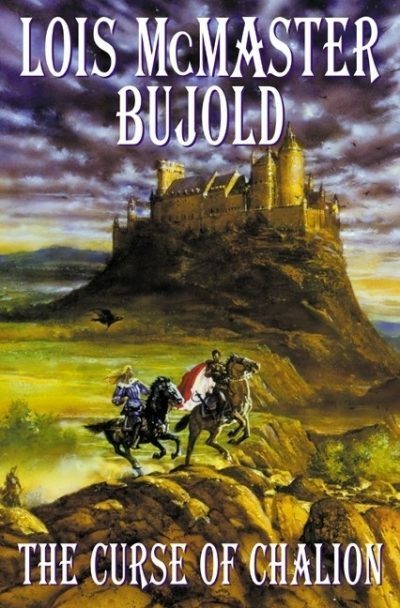 Although perhaps best known for her long-running hard SF  series, the Vorkosigan novels, Lois Bujold is also a popular writer of fantasy novels. Between 2001 and 2010, Bujold published nine novels; seven of those were fantasies. 2001’s  Hugo-nominated Curse of Chalion, the first volume in the eponymous trilogy, was the first of those seven novels. Throughout his eventful career, former courtier and soldier Cazaril has participated in many diplomatic successes and military victories … although never on the winning side. Having survived the rough hospitality of the Roknari galleys, a ragged, weakened Cazaril makes his way to the town of Valendia. He hopes that his past service for the Dowager Provincara will convince her to grant him some easy position within her household. Not only is he still recovering from his recent tour as a galley-slave, he has powerful enemies and needs to stay as far from the royal court as possible. He gains an unanticipated and unwanted success; he is appointed secretary-tutor to the headstrong Royesse Iselle. The Provincara hopes that Cazaril’s age and experience will help him temper Iselle’s well-meaning idealism with caution. Unfortunately, his new position, secretary-tutor to a princess in line for the throne, will expose him to the notice, and the malice, of the court. Even before he begins his job proper, Cazaril muses that it might be faster if the Provincara were simply to have his throat cut on the spot. Time and exposure will show that Cazaril was, if anything, too optimistic. The Royesse Iselle is cursed. In fact, Iselle’s entire family, the ruling family in the land-locked kingdom of Chalion, is under a curse. They’ve been under that curse ever since their ancestor Fonsa turned to forbidden death magic in desperation, hoping to save his kingdom from the all-conquering Golden General. Death magic always demands a cost: the soul of the caster in addition to the soul of the victim. In this case, the abrupt termination of the Golden General, who was divinely destined to unify all of the small kingdoms and principalities of the region under his rule, demanded an extra payment: the curse that has been blighting the fortunes of Chalion ever since Fonsa made his unfortunate choice. Orico, Roya (King) of Chalion is just as much a victim of the curse as the rest of his family. Aware that his relatives’ strengths are twisted in harmful ways by the curse, Orico is indecisive. He is always afraid that the curse will warp his most reasonable decisions into yet another setback for the kingdom. Hoping to sidestep the curse, he has come to rely more and more on his undeniably talented chancellor, the March dy Jironal. Alas for Orico’s good intentions, dy Jironal, while talented, is also very very ambitious; Orico’s good intentions have saddled Chalion with what other traditions might call an evil vizier. An evil vizier whose brother Dondo is the very man who most wants to see Cazaril safely silenced. Summoned to Zangre, the royal castle, along with the rest of her retinue (including a rather alarmed Cazaril), Iselle is the subject of unwanted advances from Dondo. When she refuses Dondo, the chancellor goes over her head. He convinces Orico to betroth Iselle to Dondo. Iselle appeals to Orico in vain. Cazaril can see only one way to save Iselle from the marriage. Bujold admits up front that the inspiration for this setting is Spain in the period of Isabella and Ferdinand . While some elements of historical Spain are reflected in Bujold’s secondary world—the Quintarians are roughly analogous to the Christians, while their rival Quadrenes are analogous to the Muslims—there are differences. Both Quintarians and Quadrenes are polytheists. Also, as I am certain a lot of modern readers familiar with Spanish history will be relieved to hear, there’s nothing analogous to the Alhambra Decree in this fictitious world. Mind you, while it’s true the Quintarians don’t seem to be as … energetically pious… as Isabella and Ferdinand’s court, the main reason there’s no impetus to scapegoat this world’s version of the Jews is because, as far as I can tell, Bujold’s secondary world doesn’t seem have any group analogous to the Jews. I guess that made things tidier all round. Science fiction and fantasy authors who draw on very specific historical periods face a vexing problem: how much should the author modify the historical culture and history so that the result is palatable to modern audiences? Even going back a few decades will get the author into some serious values dissonance. Fifteenth century Spain had many beliefs that most modern readers would find abhorrent. Bujold tones down the less pleasant aspects of Spanish Catholicism. Her Quintarians are, by modern standards, most of them decent, sympathetic people; there’s no analog to widespread anti-Semitism and they accept gays. The Quadrenes, by comparison, are less appealing, being, among other things, violently homophobic. I’ll let you folks discuss the subtext of those choices in comments. Also convenient from the “keeping James happy” angle is the book’s illustration of the fact that monarchy is most commonly an inefficient method of government. Orico is mismanaging his kingdom and possibly inviting abrupt dynastic change. The neighboring realm of Ibra is in the middle of a fairly ugly civil war between the Fox of Ibra and his oldest son. Autocracy works well when the country wins the lottery and gets a competent, public-spirited ruler without conniving relatives; this is roughly as common as winning the lottery in real life. While Bujold’s world isn’t as prone to theological excess as historical Spain, it does not seem any better when it comes to the rights of women. As near as I can make out, aristocratic women can only hope that their eventual arranged marriage isn’t too horrible and pray that they don’t die in childbirth. Bujold is constrained by her historical model here—though she does grant her female characters the possibility of actual, efficacious healing magic. That might reduce deaths in childbirth a smidge. We also see women as healers and priestesses, women running businesses, and noble women who, once widowed, can directly exercise real power (none of which, I admit, was entirely unknown in the place and time Bujold is using for her model). Curse is a solid novel and it was no surprise that it was nominated for a Hugo. Interestingly enough, The Curse of Chalion was nominated in the same year as Connie Willis’s Passage. Throughout the 1990s both Willis and Bujold had a track record of crushing their rivals. I believe 2002 was the first time both Hugo powerhouses had novels on the same ballot. It would have been interesting to see which of them vanquished the other. Why, just possibly, the stress of having to decide between them would have caused a space-time anomaly that would have consumed the WorldCon. The voters picked a third option, American Gods by Neil Gaiman. Personally, I would have picked the Bujold over the Willis, and indeed over the Gaiman that actually took home the Hugo. Luckily for me (because I didn’t check before writing this section in first draft) The Curse of Chalion is available in ebook and in trade formats. I will say I am a little surprised that I cannot seem to find a current hardcover or mass market paperback. If that’s what you want, you will have to hie thee to a used bookstore or online venue. 2: Should I count the December 2000 special edition? I think not and not just because I would have to rework my first paragraph. It is too bad that there is not enough space in the margins of this review to explain further. 3: Bujold might also have been thinking of how power passed from the Merovingians to the Carolingians. I expect that Charles Martel and dy Jironal would share many common interests (i.e. power, how to get it). 4: It’s probably just as well that Cazaril and Dondo were enemies, because “Cazaril helps the dy Jironals eliminate the Roya’s male heirs, marries Iselle off to Dondo, and then arranges for the Roya to have a fatal shaving accident” would have been a darker novel than the one we actually got.